The Democratic side thanked volunteers while the Republican side said the ticket was hurt by Rep. Tom MacArthur and President Donald Trump. 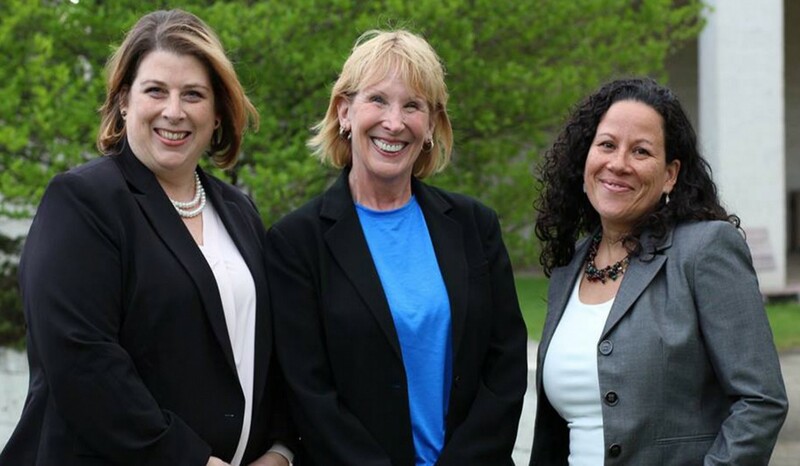 From left are Evesham mayor-elect Jaclyn Veasy, councilmember-elect Patricia Hansen and councilmember-elect Heather Cooper. The political pendulum has swung in Evesham Township. Come January, Evesham Township will have a new mayor and two new members of council — all three of whom are Democratic newcomers. This will mark the first time the township will have a Democratic majority control council since municipal elections became partisan affairs in 2009 when the township approved moving municipal elections from the spring to November. According to unofficial results from the Burlington County Board of Elections as of this article, out of 20,230 votes cast, Democrat Jaclyn Veasy received 10,503 votes (51.9 percent) in the race for Mayor of Evesham, compared to incumbent Republican Councilman Steve Zeuli’s 9,713 votes (48 percent) for mayor. In the race for two open seats on Evesham Township Council, Democrat Heather Cooper received 10,524 votes and Democrat Patricia Hansen received 10,505 votes, compared to incumbent Republican Deputy Mayor Deb Hackman’s 9,548 votes and Republican Jay Levenson’s 9,196 votes. As such, when the three new Democratic newcomers are seated in January, the two remaining Republicans on Evesham Council will be Ken D’Andrea and Bob DiEnna. In a release sent out after their win, the team of Veasy, Cooper and Hansen thanked a “large, dedicated group of volunteers,” along with “incredible support from friends and family” for their election victory. Veasy works as a senior claims adjuster at a national insurance company, Cooper works as a resource and development director for a local nonprofit and Hansen is a retired human resources assignment specialist for Amtrak. Veasy, now mayor-elect, said “exciting” and “challenging” work would now begin, as she and her team looked forward to working on behalf of all Evesham residents to increase a greater sense of community in town. In a message posted to the Evesham Township Democratic Party’s Facebook page before final results were in, Evesham Democratic Committee Chair Phil Warren also spoke of the Democrat’s campaign. Warren and other critics of Evesham’s elected leaders have often stated a belief that those who currently sit on council could be disrespectful and intimidating to residents, especially during comments made at township council meetings, in particular comments made by incumbent Mayor Randy Brown. After 12 years as mayor, Brown was not on the ballot this year, as he announced in September he would not be running for re-election due to unspecified future professional opportunities that had become available to him in 2019. Brown spoke on behalf of Evesham’s Republicans who lost this week’s election, although he differed from local Democrats when he said he didn’t believe local issues or personalities in Evesham were the driving force behind this week’s results. “The election was 100 percent at the feet of Tom MacArthur and his decisions on health care, the SALT and Trump,” Brown said. Rep. Tom MacArthur (R-NJ 3) gained somewhat of a national profile last year with what many came to call the “MacArthur Amendment” during Republicans’ attempt to repeal the Affordable Care Act — former President Obama’s signature legislation. MacArthur’s amendment helped revive the Republicans’ stalled effort to repeal the law with a plan that would allow states to opt out of requiring insurers to cover certain types of “essential health benefits,” such as maternity care. MacArthur’s amendment would also allow states to waive the portion of the Affordable Care Act that restricts insurance companies from using pre-existing conditions as a factor in charging consumers different prices for health insurance premiums. While the Republican effort to repeal the Affordable Care Act passed in the U.S. House of Representatives, that effort ultimately failed in the U.S. Senate, mainly due to what many considered a surprise vote from former Sen. John McCain. MacArthur was also the only congressional representative from New Jersey last year to vote for President Donald Trump’s signature federal income tax overhaul. The overhaul, when passed, put a $10,000 federal cap on the SALT (state and local tax) deduction. The SALT deduction is widely used in New Jersey and several other Northeastern states with costly state and local taxes that can exceed $10,000 for residents. Brown noted local Republican leaders had many private discussions with MacArthur and his staff members leading up to MacArthur’s votes related to health care and taxes. “There were plenty of people in the Republican Party who were not happy with his votes and who made sure he and his staff knew that,” Brown said. Brown described Nov. 6 as a “a sad day in Evesham history” where thousands of voters who came out to say “no” to Trump and MacArthur also ended up saying “no” to what Brown described as the financial stability he and his fellow local Republicans have brought to the township. As Brown noted, Democrats also picked up council seats in nearby Moorestown and Mt. Laurel. As with Evesham, control of Moorestown’s municipal government will also now shift to Democrats, although Republicans will remain in control in Mt. Laurel. To the supporters of the Zeuli, Hackman and Levenson ticket, Brown thanked them for their support during the campaign and their support throughout years past. With that in mind, Brown called for a discussion in town on the possibility of moving future municipal elections back to the spring so residents would be weighing in on township issues alone. “In order to save money and get higher voter turnout we moved elections to November, never thinking in our wildest dreams that we were going to get 20,000-plus people, half of who couldn’t care less about the township and only have what their vitriol is for the president,” Brown said. As for the race for the U.S. Representative for New Jersey’s 3rd Congressional District, as of this article, Andy Kim (D) had declared victory against MacArthur. In the portion of Burlington County encompassing the 3rd District, Kim had 101,903 votes to MacArthur’s 69,090 votes, and in the portion of Ocean County encompassing the 3rd District, MacArthur had 76,868 votes to Kim’s 46,667 votes. When totaled, that left Kim in the lead, with 148,580 votes to MacArthur’s 145,958 votes. Lawrence Berlinski of the Constitution Party also received 1,220 votes in Burlington County and 2,595 votes in Ocean County for a total of 3,815 votes.